We (the owners of this place) work on the problem of quantum light-matter interaction. While our most important results are general and not linked to any particular platform, there is one specific system that which we often consider, namely, excitons in a microcavity. The latter is a cavity of micrometric size, for instance realized with alternating layers of semiconductors of drilling holes in a slab (photonic crystal). The cavity can sandwich an entire plane, in which case the physics is in 2D, or it can be etched to be 1D or make the confinement step total and circle around a single, atom-like object, typically a quantum dot, in which case it is 0D. The 2D case is interesting for macroscopic degeneracy, with a lot of particles acting as one, with outreaches such as Bose-Einstein condensation, superfluidity, superconductivity, etc. The 0D case is interesting for microscopic isolation, with a few quanta of excitations ruling the dynamics of the system, with outreaches such as entanglement, quantum information processing, etc. 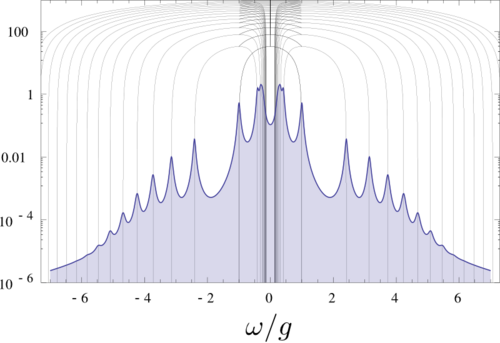 Below is a picture of a spectral shape for a quantum dot in a microcavity in the nonlinear regime, with, superimposed, the so-called Jaynes-Cummings ladder, an insight into full-field quantization, where also the optical field is quantized, an extreme you don't usually require for most theoretical descriptions. This is this regime which interests us particularly. You can see our most notable publications or see what we've been up to recently on the arXiv. Some topics discussed in more details. Galilean boost in quantum mechanics. This page was last modified on 10 March 2019, at 16:03. This page has been accessed 5,982 times.